Q. I have been competing in the amateur hunter division for years, but I would like to try some eventing. My horse did eventing before I bought him, but I’ve never ridden outside of an arena. What sort of position work should I focus on before I try cross-country jumping? A. Since even a novice-level cross-country course lasts four to five minutes—twice as long as most hunter rounds—you’ll need to strengthen your two-point position. 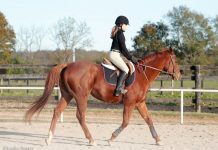 Gradually increase the time you spend riding in two-point within your arena until you can comfortably hold this position for 10 minutes in trot and, eventually, several minutes in canter. 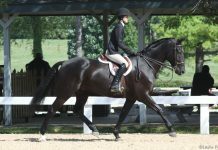 Spend most of your two-point training time in trot, since you don’t want to strain your horse’s legs by cantering endlessly around a small arena. Try to ride without stirrups during some of your arena work. A strong leg position will help you cope with the terrain changes you’ll eventually encounter cross-country. You’ll need to spend time outside the arena as part of your event preparation. Since you are new at this and your horse hasn’t left the arena for a while, don’t hack out alone—always ride with a friend on an experienced horse. Stick with walk and trot at first to make sure your horse remains obedient in the great outdoors. Ride lots of transitions. 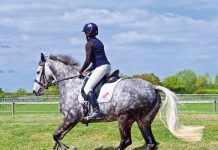 Try some easy ones at first, like walk-trot and trot-walk; then try transitions within gaits like going back and forth from extended to working trot. Practice riding up and down hills whenever possible —grab mane to help stay off your horse’s back when going uphill, then sink down into your heels and sit back a little to keep your balance going downhill. When you’re ready, entering the non-jumping division of a hunter pace is a wonderful way to gain confidence riding outdoors and prepares you for cross-country work over fences. 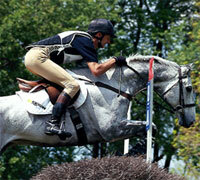 Annie Eldridge is an event rider who trains out of her Setters’ Run Farm in Duxbury, Mass. You should try getting your horse used to outdoor settings too. Take him for hacks(relaxing trail rides) and just get him used to the sights sounds smells, etc. of the fields, woods, etc. so when you go for your first show he doesn’t blow up at a leaf! Gradually work up to galloping down wide, straight trails for the good of you and your horse.